Most of us are interested in monetisaing our blogs, some not. Since there are many bloggers here I thought lets have a thread to discuss this issue. Which advertising publisher networks have you employed on your blogs? And how is you experience with them generally? Any Google Adsense alternatives to suggest? 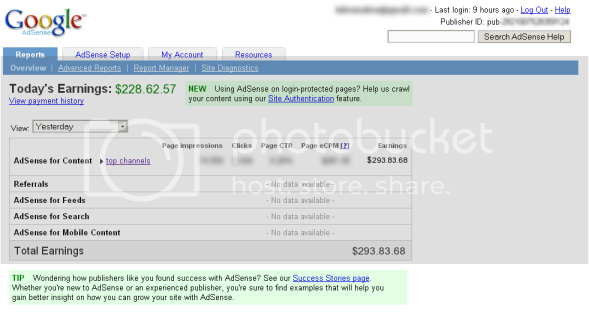 I am very satisfied with Google Adsense. Using Infolinks since 3-4 weeks and its doing well. Adbrite didnt do well when I had introduced, I think last year hence discontinued it. Adphilia which I introduced 2 weeks back is not doing well, hence may discontinue it by month end if its performance does not improve. Still waiting to get an ad through BlogAds. But individual companies who approach you, pay nice money! What may work with one blogger may not work with another, so do share your individual experiences here. PS: If you are zapped with the Google Adsense stats, dont be! Its a fake, and definitely not mine. I'm sure you have heard about people claiming to be making millions of dollar with Google AdSense. Their proof to convince you is often a simple screenshot. So just to make a point, I generated a fake one with this website. I also found some nice Adsense tips here, btw. Someone else I know recommended Yarie.com, but from what I understand, you need some minimums before they consider or accept you. You probably meet them anyway. I have done well at times with affiliates, but it is not that consistent, I have found. Last edited by James; 22nd October 2009 at 09:16. As you know, I use Adsense and Adphilia on Into Windows. I am quite satisfied with them. btw, that fake Adsense stat is very impressive. The amount of money I've made since I've been blogging approx a year and a half has been phenomenal! I'm one of those millionaire-bloggers $0.01, every two days! Do the math! @Knightrider, what daily stat analyser do you use? Oh and trust me when I say this, back links don't amount to traffic or revenues most of the times. i use wordpress stats google analytics and woopra. Whats wrong with Google! They don't want to approve my Google Adsense application, because I don't write much about google. Is it TRUE?